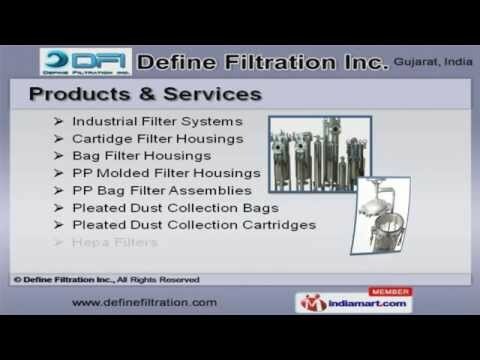 Welcome to Define Filtration Inc.Manufacturer & Exporter of Industrial FiltersThe company was incorporated in 2012, at Ahmedabad. Our Contract manufacturing &OEM services help us to cater Indian Subcontinent & East Asia. Industry leading prices, Total client satisfaction & diligent manpower make us standapart from also-rans.We offer a wide assortment of Hepa Filters, Bag Filter Housings & Industrial FilterSystems.Our Panel Filter, SS Filter Housings & PP Spun Filter Cartridge are well known for theiroutstanding performance.PTFE Filter Cartridges, SS Bag & Basket Filter Housings offered by us are in hugedemand across the global markets.Our Liquid Filter Bags, Basket Filter Strainers & Gas Filter Housings are extremelyreliable.We also provide Pocket Filters, SS Filter Cartridges & Cartridge Filter Systems that arewidely acclaimed in the market.Along with that we offer Air Compressor Filter & SS Wire Mesh Filter Elements that arenothing but the best solution for all your needs.